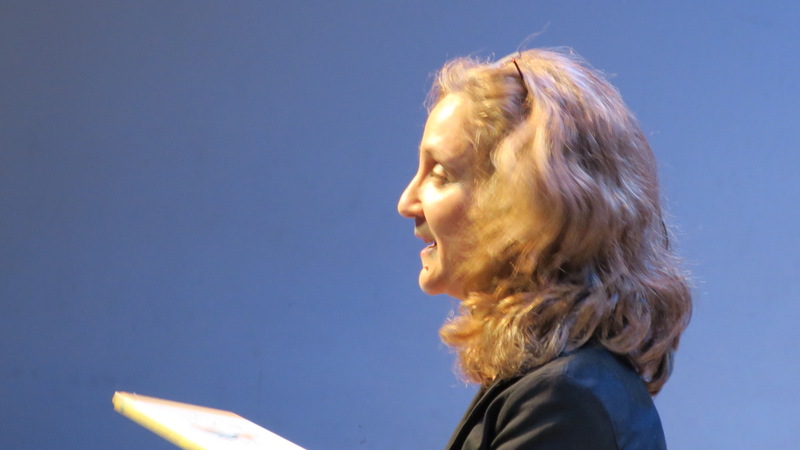 Poet Madeline Artenberg set the tone for the evening with her accomplished reading of several poems. Madeline’s history as a photojournalist and street-theater performer informs her work. 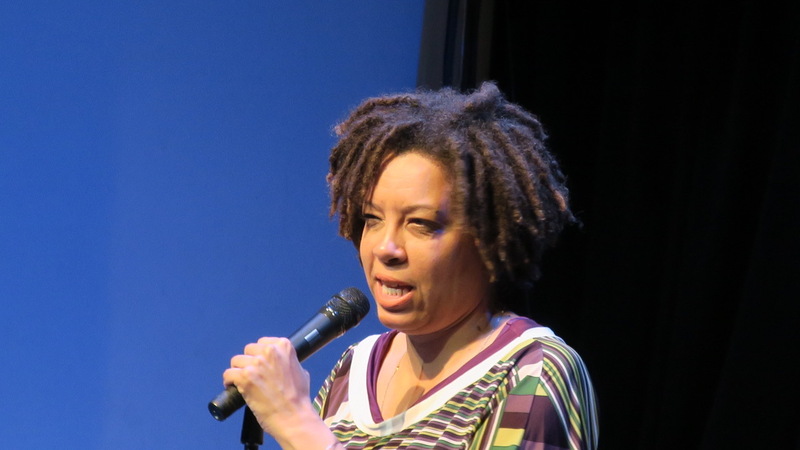 She dealt with injustice on the world stage in “Demokratia,” a first-hand account of living in Athens under the Colonels and in “Tibet, Land of the Snows.” Her more personal pieces included “Ruse of the Flute,” about a young girl’s abusive family and “After Death,” about a daughter’s relationship with her dead mother. Jill Caryl Weiner has a brand-new book, and was proud to have family members at the Salon to celebrate its release. When We Became Four: A Memory Book for the Modern Family helps growing families get ready for that next great adventure: the second baby. This memory book and family journal is warm and funny with easy checklists and creative prompts, in the style of her best-selling When We Became Three, called “the most clever and creative baby journal.” Jill’s enthusiasm for her work is obvious. She reminds us it a great gift for Mother’s Day and Father’s Day, or any day when the family is expanding. She asks us to support local bookstores, such as Bank Street Bookstore on 107th and Broadway. Find them also at Barnes & Noble and on Amazon. Salon members had the fun of watching Dublin playwright Derek Murphy develop his hilarious dark comedy Dyin’ for It here at the Salon. He’s currently working on The Love Parts; six short plays about bad relationships. 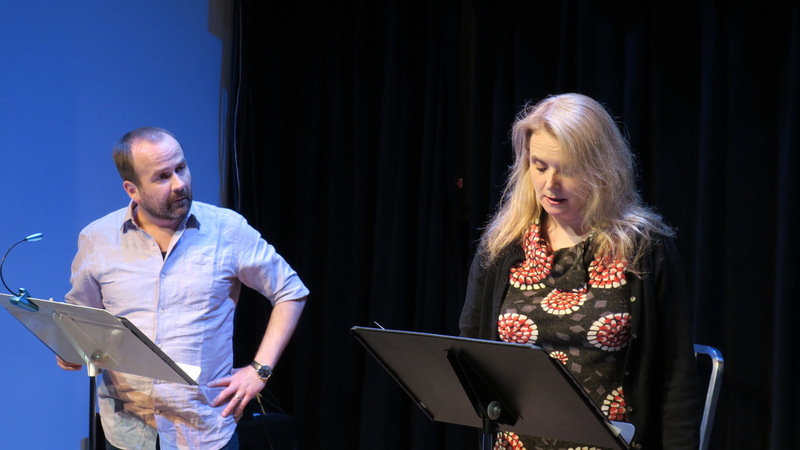 One, “The Woman Driver,” read by the wonderful talents Maria Deasy and Ciaran Byrne portrays the final unraveling of a relationship that should not have lasted as long as it did. Notes Derek, “this is one driver you don’t want to get in the car with.” And he promises more parts of The Love Parts, and more fun, to come. 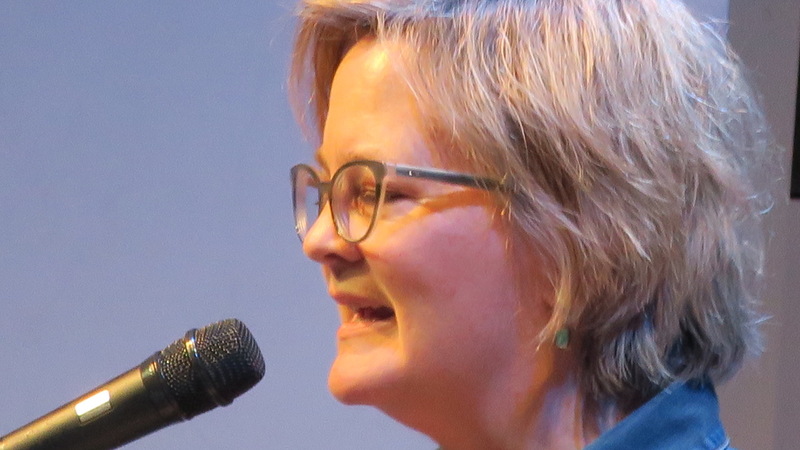 Marni Rice thrilled with an excerpt, in song and narrative, from her solo work-in-progress In Search of the Past: Memories of a New York Farm Girl from the 1920’s. It’s based on the life of her grandmother— a farm girl, Vaudeville performer and early student of Martha Graham —and set soon after women had won the right to vote, but still lacked rights within their own households. Playwright/composer/performer Marni performs in French and English and her work has been have been produced at festivals around the world. With a recent MFA from City College, Natasha Herring inspires change through her writing, compassion advocacy, teaching and filmmaking. She inspired tonight with her brilliant chapter “Strange Fruit” from her memoir Raining Sunshine. Natasha’s description: “Sunshine’s (the protagonist’s) allegorical exploration into the oasis of Okavango Delta after a sexual assault. She searches for a semblance of healing amongst the lions, baboons and grasshoppers only to question race, sexuality and her upbringing on the Lower East Side.” “Strange Fruit” will be published.in the Kweli Journal. Visit www.natasha-herring.com. Poet Marcia B. Loughran always notes how grateful she is for the opportunity of sharing her work with sounding board of the Salon. Let’s say our appreciation for Marcia’s work and warm voice is mutual. 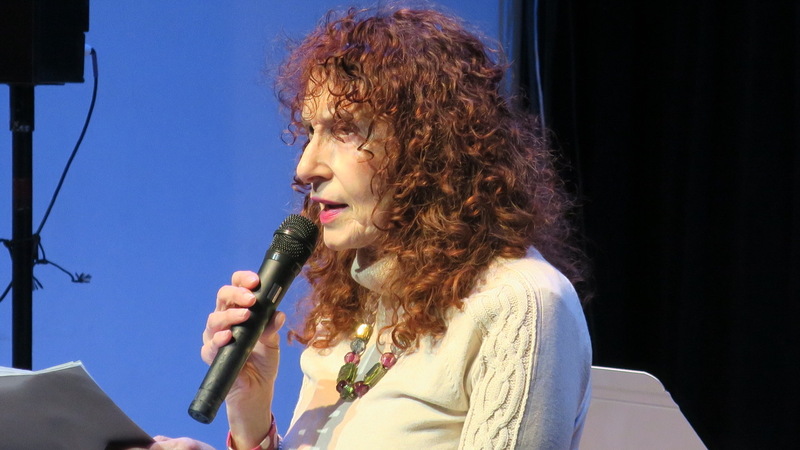 She optimistically shared a poem about spring, “Astoria Park, April” where she “checks on the trees” to salongoers dressed for the frigid April evening. She then tapped into our shared nostalgia for the cousins we all grew up with two poems dedicated to her cousins, “Rowboats, Lake Mansfield” and “The World is Smaller When We Name It.” Her chapbook Still Life With Weather is available online. Leilani McInerney has performed in The Fantastiks, at the Amato Opera House and in regional theatre. Now she is creating her own material in poetry and monologues. 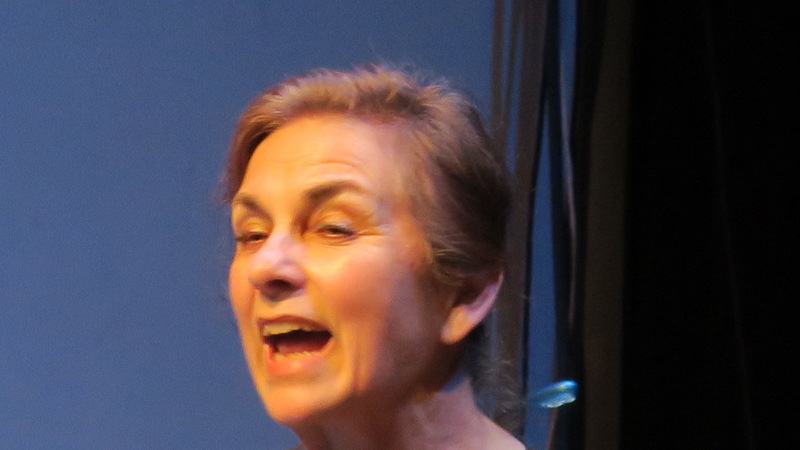 Tonight she offered an original, stunning monologue hearkening back to an experience she had as a child growing up in Texas, titled “Love Field.” Though very young at the time, the event still resonates in her life. Funny, she notes, how things resurface. 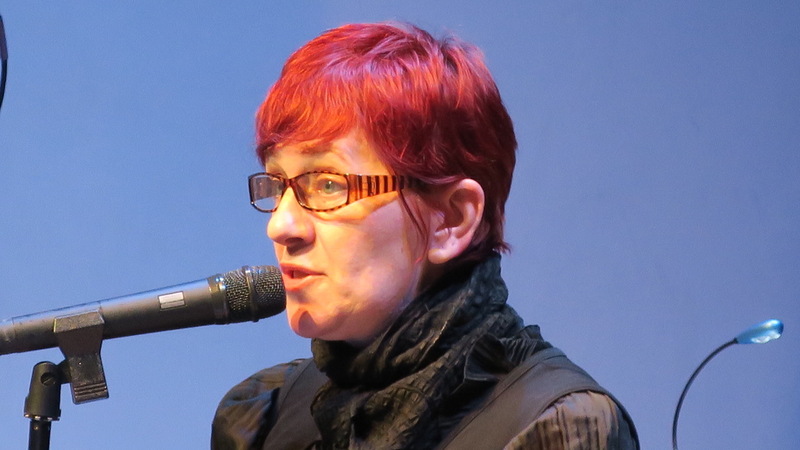 Another gifted multi-talent, Guenevere Donohue closed the evening with a tribute to author Samuel Beckett and the Easter Rising, both born in April. Performing Clov from Beckett’s Endgame, a slave attempting to leave his master, Guen showed her dramatic skill. As a fine way to close a powerful program, Guen sang a soaring rendition of Padraig Pearse’s infamous and inspiring Irish language poem, Mise Éire, set to Patrick Cassidy’s music. Thanks to Maureen Hossbacher for hosting. Don’t forget Jill Weiner’s books, seen here, along with Maureen’s new chapbook, which will be featured soon at a Salon! Join us next time, Tuesday, May 1 at St. Patrick’s Pub at 7 pm.